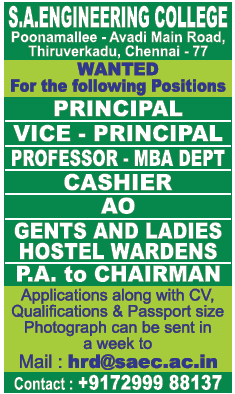 S.A Engineering College, Chennai has advertised in THE HINDU newspaper for the recruitment of Teaching Faculty- Assistant Professor / Principal / Vice-Principal Plus Non-Faculty jobs vacancies. Interested and eligible job aspirants are requested to apply within 07 days from 24th March 2019. Check out further more details below. About College: Mission- To create an excellent teaching and learning environment for our staff and students to realize their full potential thus enabling them to contribute positively to the community. To significantly enhance the self-confidence level for developing creative skills of staff and students. How to Apply: Interested and eligible candidates are requested to send application along with CV, copies of certificates and recent passport size photo the email address given below.